Car insulation offers the lightest & most effective thermal sound deadening insulation in the world! This roll of material is an EXTREMELY light-weight sound deadener & thermal barrier that creates a quiet, comfortable, and efficient interior for any vehicle. It will keep you cool by reflecting unwanted engine, header, exhaust, & summer heat but it will also keep you warm in the winter! It is extremely flexible & very easy to cut, handle, and install. It is used by professional race teams, auto restoration shops, & many customers around the world. This can be installed in any vehicle in the entire interior. Car insulation is 1/4" thick overall and weighs 0.04lbs per Sqft so every 25Sqft roll of material weighs only 1.00lb! This is NOT a Jute or Butyl based product. It's a closed cell polyethylene. 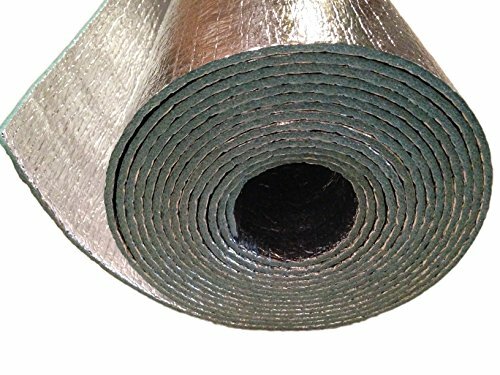 This can be used in ANY VEHICLE to insulate & sound proof your entire interior: floor pan, doors, under your carpet/seats, headliner/roof, trunk, trunk lids, and firewall (interior side). Car insulation is used in many automotive applications: muscle cars, hot rods, corvettes, imports, tuners, street rods, rat rods, classic cars, race cars, stock cars, old vintage cars, pickups, trucks, low riders, etc. We even have customers who use it in their airplane, SUV, RV, limousine, camper, boat, motor home, or school bus. Installation - There is NO ADHESIVE on our material but you have many options when it comes to installing it including spray adhesive, foil tape, double sided tape, etc. It is very flexible making it so simple & easy to install. Spray adhesive & foil tape in combination with each other has worked best for installation. Foil tape is optional to use with spray adhesive but helps you achieve the best thermal barrier results. For the ultimate install - double layer it! We have many sizes to choose from so please check out our other listings! If you have any questions about this product by Carinsulation.com, contact us by completing and submitting the form below. If you are looking for a specif part number, please include it with your message. Thermo-Tec 14710 Super Sonic MAT 24" X 36"